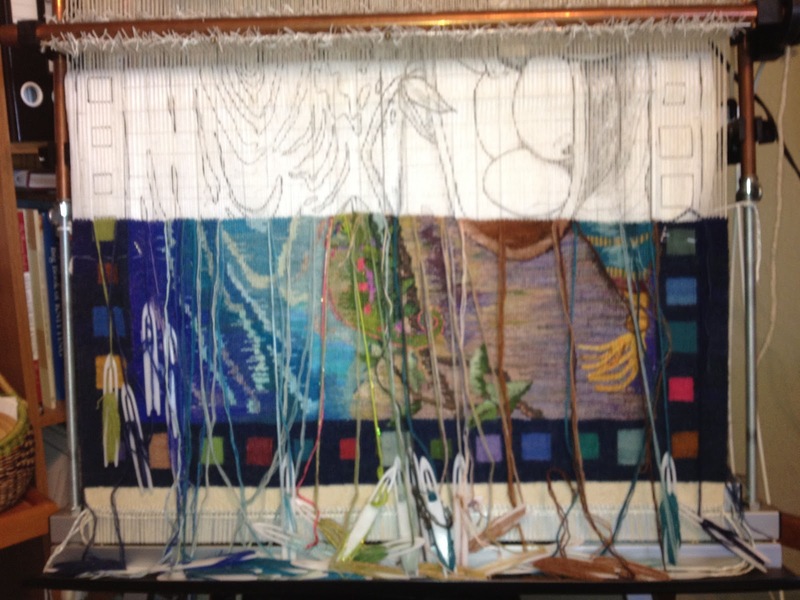 Several years ago when I began to get interested in tapestry weaving I started with using butterflies to organize my weft threads for carrying through the warp. It is convenient and works pretty well and I was also influenced by the Nancy Harvey books and videos I was learning from. There are some advantages to using bobbins though as I started to learn as I did more tapestry weaving. 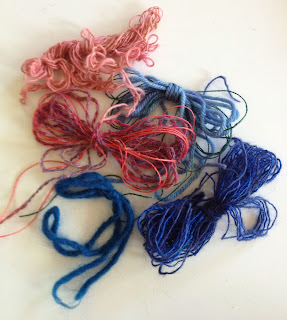 They help keep the thread neatly organized and this is particularly helpful in working with the handspun singles that I often use. Also the slight weight of the bobbin can make moving them through the warp threads more fluid and efficient. 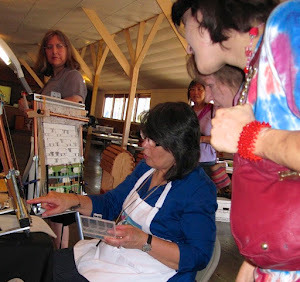 At the time I had entered a Long Distance Learning program through the American Tapestry Alliance with Janie Hoffman and even though I was unable to finish it do to some family emergencies at the time I am so grateful for the interest and advice she gave me. You can see her art work here: www.artistsregister.com/artists/AZ104 . One of the things she introduced me to was using plastic netting shuttles as tapestry bobbins. There are many advantages to working with netting shuttles, they are cheap, light weight, come in many sizes from about five inches to thirteen inches long, it is also easy to wind threads on them and the threads stay put when you do. For the handspun they really help to tame those singles and keep them neat. Their light weight is an advantage if, like me, you tend to have a large number of bobbins going at once and you like to take projects with you. I have been very happy with them. You can see them in many of the photos of work in progress on this blog. 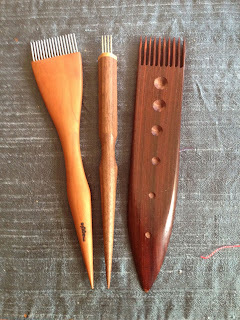 One disadvantage is that you can not use them to pack the weft threads as you weave. For that I usually hold an awl in my hand and use it to pack as I go, in fact I hardly ever put it down when I am working. 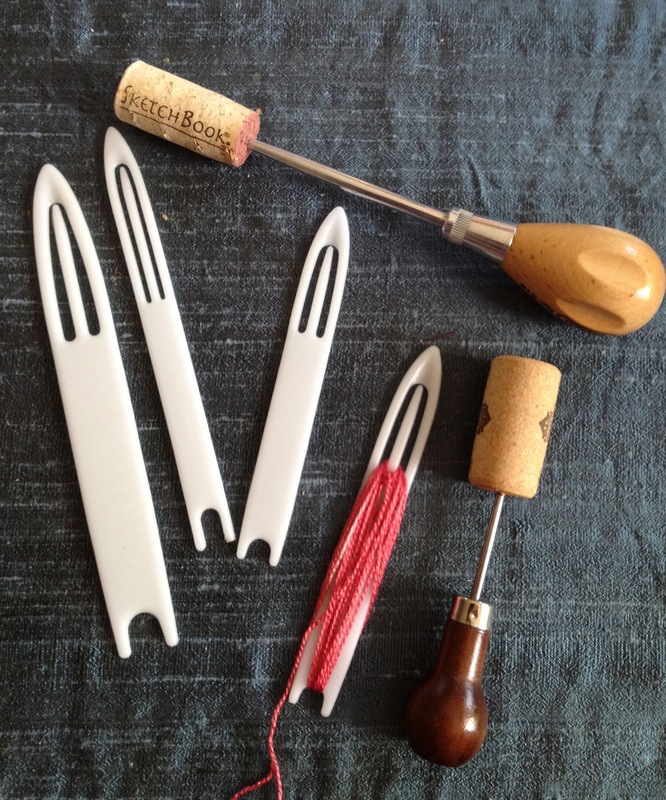 You can see the awls above with the netting shuttles that I use most often. After every few passes I may also take a beater or comb and pack the wefts down again. 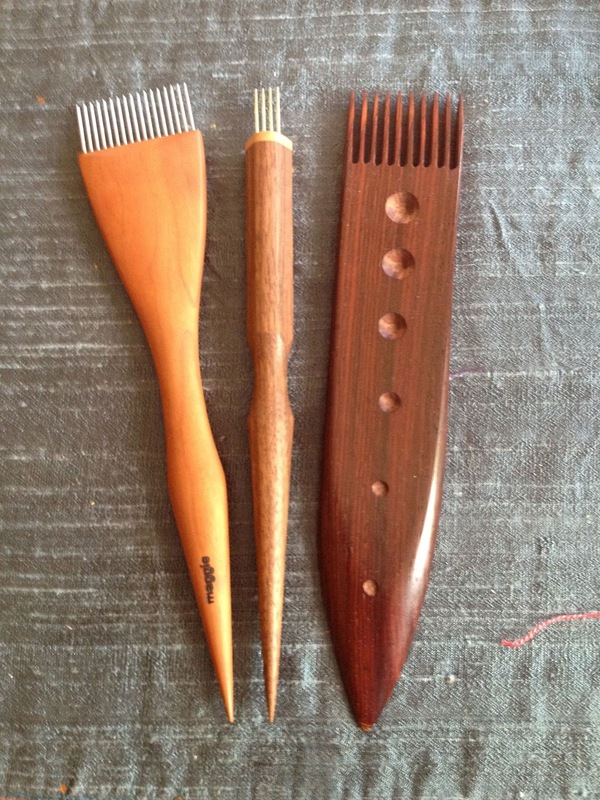 See some of the beaters I use pictured below. I suspect that I will like them and start using them at least in part but I don't think I will want to give up my netting shuttles especially for work on the go and I will probably always just pull out a length of thread and start weaving for the tight spots and small pieces that I do. Fine Fiber PRess has a large selection of different size bobbins. John Mosss is now making a really small brassy bob that I love. I also have a video on the care and feeding of bobbins on u-tube.